Two pair of blue socks finished! One Finished—Undone, capute, no longer a lingering mistake! Normally, I like to stop after each row or two, and admire my handiwork. This is good for my ego, and good for my knitting. It's rare thing for a error to slip by. I sometimes tink, (a row or two) but rarely frog. Some times I undo and mend a small mistake with a crochet hook, but rarely do I have a whole row of mistakes. Rarer still, 2 or 3 rows. 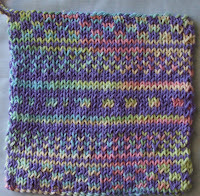 But, every once in while, when tired, and knitting at night –in spite of my lovely admiration, I mess up. I am by nature a morning person, and while in my dotage, I have learned to stay up late, I recognize, I don't think as well after 10 PM --and while I have no problem with the idea of staying out all night partying, I tend not to drive after 10 PM.. I just don't have the same level of alertness late at night. 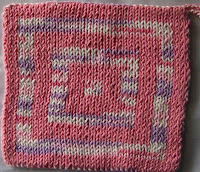 In the fresh light of the morning, when I looked at my knitting, I saw something that amazed me. Instead of the lovely lacy pattern.. I find knits and K2tog, and Knits and YO's, scattered about, something like a pattern, but not actually in a pattern. Obviously, I had chosen the wrong pattern for this yarn, for this sock.. and out they came. 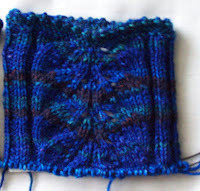 I was past the heel, and just about done with the gusset--but no matter. I unraveled the whole thing. And started over. Toe up this time, on as smaller needle for a tighter gauge, and a totally different stitch pattern. Time will tell if I have made the right choice this time. 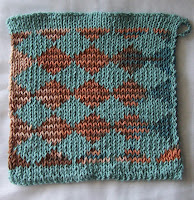 Even though this new stitch pattern has sets of K3tog's (not the most fun stitch in the world), I am liking the effect. But before that, I finished the Sock of Blue Leaves. They look lovely don't they? I am going to post a image on the Lion Brand Gallery. Maybe the powers that be at Lion Brand will see this colorway, and bring back magic stripes in nicer colorways. I think this color way, while not perfect, is a huge improvement over the Jelly Bean colors I started with! Getting stuck on a pair of socks, (these) made me forget how much I usually enjoy knitting socks. I ended the leaf pattern (as I do most instep patterns) just after the gusset. I tend to wear practical no nonsense shoes—sometimes slip ons, some time oxfords, rarely mary-janes, and my shoes tend to come up rather high on the instep. I don't like the feel, usually, of lace, or ribs, or cables on my instep, inside of my shoes. That's part of the fun of hand knit socks. Those idiosyncratic likes and dislikes we all have can be met and satisfied. In a convoluted way, this links fashion with politics. Not fashion the noun, but fashion the verb. Though The American Heritage® Dictionary of the English Language: Fourth Edition, claims that to CONTRIVE is an obsolete meaning of fashion, I would differ. How does “To contrive” differ from “to give shape or form to”? NOUN:1. The prevailing style or custom, as in dress or behavior: out of fashion. 2. Something, such as a garment, that is in the current mode: a swimsuit that is the latest fashion. 3. The style characteristic of the social elite: a man of fashion. 4a. Manner or mode; way: Set the table in this fashion. b. A personal, often idiosyncratic manner: played the violin in his own curious fashion. 5. Kind or variety; sort: people of all fashions. 6. Shape or form; configuration. 1. To give shape or form to; make: fashioned a table from a redwood burl. 2. To train or influence into a particular state or character. 3. To adapt, as to a purpose or an occasion; accommodate. 4. Obsolete To contrive. IDIOM:after (or in) a fashion In some way or other, especially to a limited extent: She sings after a fashion. ETYMOLOGY:Middle English facioun, from Old French façon, appearance, manner, from Latin facti , facti n-, a making, from factus, past participle of facere, to make, do. So look at this info on the root! It is fascinating! See dh - in Appendix I.
I personally chose what I want. And these sort of personal choices are a form of politics. Politics is personal, and politics is local. Knitting (sock or other knitting) is both a personal choice and a political one. Fashioning socks, or other clothing, be they fashionable or otherwise is a political choice. One good deed accomplished this weekend—3 packages mailed, 1 box ready to mail (filled, sealed and addressed) and one more package addressed, and ready to go. And go they will Monday. I really needed to get my act together, since I will have more things to send off next month, (and since the box is now a full month late (see Mea Culpa) I really need to do something! I am loving my newest socks! 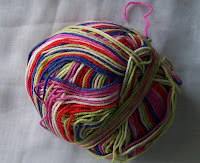 Here is the over dyed Lion Brand Magic Stripes, (originally color way, "Jelly Bean"-- now shades of blue) looks knit up. As I looked for a pattern, I stumbled across one I really liked—so now I have the Socks of Blue Leaves..
One socks has been stretched (a index card does the trick) so you can see the pattern detail. 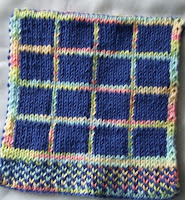 I love the color way, I love the stitch, I love the soft picot edge that the channel Isle cast on gives. Which is better—English or Continental? 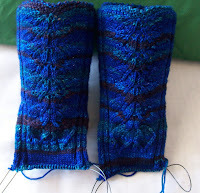 Which is better—flap/turned/gusset heel or Short rows? and The Quests for the Best. What is BEST way to make socks? Toe Up or Cuff Down? 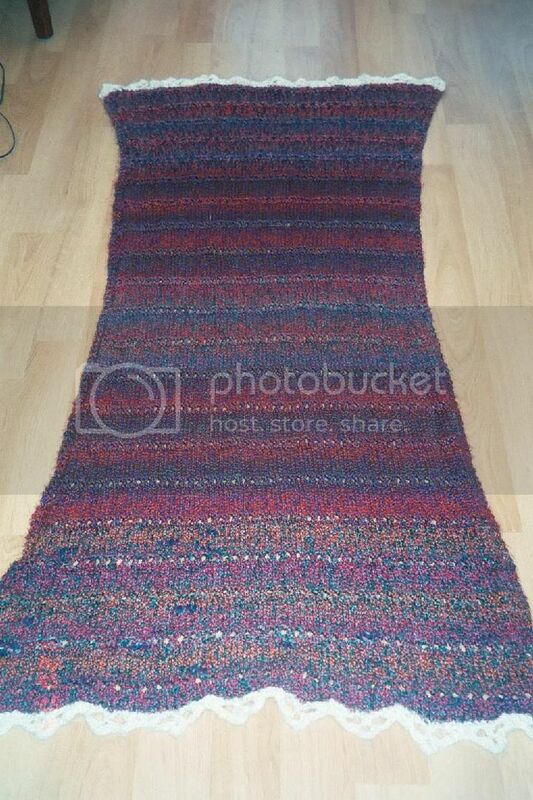 I have no problem with knitters who only knit scarves –even those who only knit scarves in garter stitch. That doesn't satisfy my needs, but its a perfectly valid way to knit, to be a knitter. And I have no problems with knitters who have clear preferences—who only knit with a certain sort of yarn, or certain needles (be it a certain style or certain material). But I Hate false dichotomies, and quests for the best. The Best of anything is subjective. Then they rank based how things fare compared to factors being measured. There are very few things in life (and knitting) that only offer an either/or option. Have you ever flip a coin, had it bounce, spin, and while spinning, work it way into a crack and end up stopping on its edge? --even a coin toss doesn't always end in HEADS or TAILS! And Knitting is way more complex than a coin toss! I love knitting in Wools. And my favorite shawl, the one I wear most? It's made from Lion Brand Homespun. Irregular mill ends, 2 color ways, in different dye lots, and still beautiful. 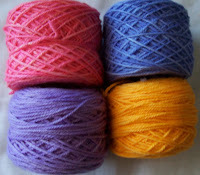 Cotton has a place in my knitting too, and so does linen, and for that matter, blends of wools and synthetics. What is the best fiber?Depends-- what are you knitting, and for who? What are the best needles? Depends-- What kind of knitting do you do? What is the best reference book? Depends—on what your current skill level is, and where you want to go with your knitting. What is the worst thing you can do? Think there are only 2 choices! And that there is a clear BEST –one that doesn't need qualifying criteria to establish! Heels done and all the weaving in of tails too! A dozen or so row before the heel placement, on the INSTEP side of the sock, begin adding stitches. 4 to 6 stitches at either edge (I place mine 1 stitch in from edge)--Increase 1 stitch (each side of the instep) every other row. I use a lifted increase (easy-peasy on right side, no so much fun on left side) since I think this is one of the easiest tightest (no holes) increases. If, (as in these socks) I complete my increases before I reach the right row for the heel, I just continue (in this case, 2 rows) knitting with no increases or decreases. After working a row of waste yarn for the heel, I start decreasing, reversing the pattern and decreasing 1 stitch (each edge) until I am once again at the correct number of stitches. Knitting 8 stitches to the inch, 2 sets of 4 stitch increase yields an extra inch of ease at the widest point of the heel.. and for me, make the difference between socks that fit, and socks that almost fit, (and are a pain to put on and take off). I need to give a big thanks to Janis (aka Knit*Therapy), this sock yarn got me going.. (I haven't knit a pair of socks in 6 months!) I love how the finished sock looks, and can't wait for the fall to wear them! The last skein of yarn has been dyed, too--for now. I'll need to get some more white wool and more dye stuff before I can continue. 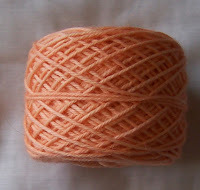 This skein is a bit lighter than I wanted—but still a nice cream-cicle orange. I'll keep it as is—and work for a darker orange at some point in the future. 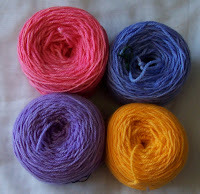 Here is a flower of the newly colored yarns in my stash. Sans heels, but on the way. A little ruffle at the top edge. (a fail proof bind off for top up socks is a lettuce edge—its virtually impossible to make it too tight!) I didn't have any socks bound off this way, so now there is one for my collection. Right away, you'll be thinking. Um, that ruffle is a bit much isn't it? Remember-- I said there was a bit of shaping in the leg—look –and no the answer isn't that I have knobby ankles and thin pole like legs! And No, I didn't add reverse shaping to the sock. And that ribbing is pulling in the leg of the sock significantly—enough that the top of the leg looks significantly narrower than the foot --even though 8 stitches were added. In stocking knit, those 8 stitches would add over 1 inch. 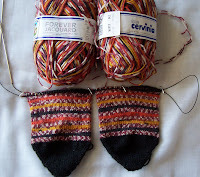 So actually, rather than getting narrower (as its seems) the socks were getting wider. Plus, the top of the sock(the black below the ruffle) has a ¾ of inch of ribbing. On, the ribbing stretches out, and the ruffle is no were near as ruffley—in stead, its soft and pretty. And now I remember why i so rarely use a ruffled edge.. 72 stitches (twice) doubled to 144 stitches, (twice) and then double again to 288 stitches (twice) to knit and bind off. The heels stitches are on the needle, and lickity split, there will be socks. Here's how the pale orange looks next to Paton's Paprika color—pretty huh? I love dying. I am blessed with a good eye for color, (compensation no doubt for being saddled with a tin ear and poor nose) and I love being able to summon up glorious colors. I really like Paton's Classic Merino yarn. It's 204 yards in a skein--a nice put up--and I rarely find a knot in a skein. It's value priced, and can be found on sale (not often, but often enough) for $2.49-making it a super value. 1000 yards (a small sweater)can purchased for $12.50! --1400--enough for a large sweater is still under $20(with tax!) at that price. It comes in a range of colors—unfortunately the range is limited-if not by Paton, definitely by what is seen in NYC. You can find blues.. light, medium and dark, but purple only comes in dark (a pure purple) and darker (a dark violet blue). There are several shades of red, burgundy, regal and rich red, not to mention paprika--a brick/orangee red. But no rose, or light reds. There is a bright pink, and a pastel pink (a color rarely seen!) but these colors aren't really shade of any of the reds. No Orange--(well Paprika could be considered an orange--but its not a true orange)—Maize is, in theory available, never seen, just dull gold. But even if ever shade made was available, there would still be gaps. 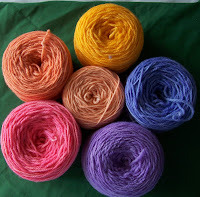 So every once in a while, I take a skein of winter white, add some kool ade or easter egg colorant, or other dye and add some in between colors.--Mostly light bright colors. So every once in a while I make an effort to fill in the color gaps. --to add the option of contrasting with some of the readily available colors. Still to come, a bright clear Orange—(I ran out of vinegar! )-and pale peachy orange is in the works, too. Kool-ade is going to add a bright lime, another color that isn't available. The taupe? Definitely a light lacy scarf. The maize? Obviously another lacy scarf–only different. 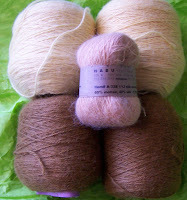 The Habu mohair and silk? I'm still thinking. I am, always have been, a bit perverse. While there are times and occasions, when I am just as influenced as the next person by peer pressure, there are times when I fly in the face of it. Take the Clapitos. I didn't much like it when I first saw it --but, then, I don't ever like scarves wrapped around my neck, not even in the dead of winter. But once it became popular, it was a death knell. Any saving grace it might have had, was done in by popularity.. It become so popular, I'll never knit it. Same, too, with some yarns. Everyone Ohh's and Ahh's over Koigu. I love the way it looks in the skein, but, then, I always like multi color yarns in the skein—even Red Heart colorsways can look beautiful in the skein. It's how they work up that disappoints me. It could have been sour grapes on my part. I have a huge stash (much of it from better times) and a limited budget. $10 a skein Koigu? With 2 skeins needed for pair of socks.. Bah, humbug. Over priced, over rated. Still, last year, when presented the opportunity to snag some Koigu, as a gift, I didn't hesitate.. It is soft and lovely. But its been a bane! 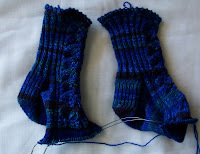 I started socks with the blue Koigu last December, and no amount of will power can get me to finish them. I've knit the cuff, turned the heel, started the instep. And every time I pick them up, I feel like it is a chore to knit them. The color way is soft, and not too spirally,--I really hate the spirally stripes that a lot of hand painted yarns create--but I persevere in being perverse. I just don't like them. There is something about me that is perverse. Everyone might be enamored by Koigu. But I am not everyone, I am me. 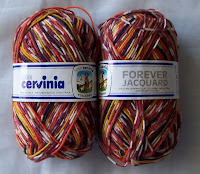 Enter Cervinia—this yarn just entranced me. It's pushing the season to knit such fall colors, but I love it. I've added some Cervinia Calzetteria in black for the toe --Don't you love the neat cast on? --The fine details of the raised increase for the shaping? --What? You can't see the detail in the photo? Nor can you see them in person! That black is such a deep black its almost impossible to see the detail in direct sun light! But they are there. The heel is going to be the same black, and there will be narrow some black in the cuff too. And there are some subtler stripes to follow.. Finally, I have re-dyed some of the garish (even by my taste which runs to bright clear colors with high contrast) Lion Brand Magic Stripes. The LB, bought from a clearance bin at $0.50 for the ball, and redyed with $10.95 (make that almost $12 after taxes!) a bottle dye, is now a medially of dark blue stripes. I am not going to try to match up the stripes. It will be a case of divide and knit—let the stripes fall where they will. Amazing what a bit of over dying can do, isn't it? There was a time in my life,when I got packages in the mail (out to others, and into myself) on almost a daily basis. I wish i could show you how lovely it was packed.. A bright red mailer, golden tissue paper, a lovely Hello Kitty note card. (but like a greedy child, I couldn't wait, and I ripped opened the package in the elevator! ) That's the good news. The bad news is, the still un-mailed box to my DIL. Susan can tell you, I started a swap with her, back in MAY –but the earrings are still in NY. 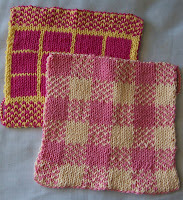 I knit potholders in May too.. But, if you check DIL's blog, you'll notice, um, I missed her birthday –already.. and, um, I still haven't mailed the package! I have other stuff too, things I think she'll like--antique kitchen ware, and stuff that she might use for print making.. and other goodies. And what kind of grandmother would I be if I didn't include something for the for grandchildren? Oh, yeah, my Son/aka Mr. KnitSonya) I should put something in for my son.. but I think he'll have to just be happy with everyone else getting goodies—coming home to a happy mate and happy children, and living in the happy household. Exactly when that is going to happen? Soon, really, honestly and truly, soon!